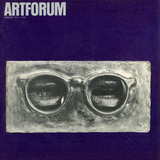 For the better part of the ten years it has been in existence, Artforum has been our leading intellectual art journal. . . . For a sizeable segment of the art public, especially in the universities, the experience of color-field painting, minimal art, earthworks, and related developments has been inseparable from the criticism, theory, debate, and documentation which Artforum has lavished upon them.